Socks - Official socks are available in three lengths: ankle, crew, and knee. Tiger socks have an orange band on the top. Hat - Official blue hat with orange front and Tiger emblem. Neckerchief - Orange triangular neckerchief with Tiger logo. Official BSA neckerchiefs are the only neckerchiefs that are part of the uniform. Neckerchief slide - Official gold-tone metal slide with orange Tiger emblem. 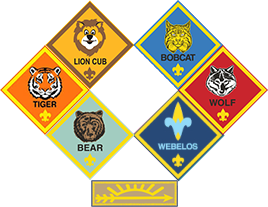 Cub Scouts may wear handmade neckerchief slides.